From Malibu to the Santa Monica Beach, this welcome gift is the perfect welcome for anyone visiting from out of town. For a true LA welcome, we've included California Earthquake potato chips, Los Angeles local chocolate company Droga chocolates (their decadent lemon ginger salted caramel collection), some oh-so-sweet citrus, Fresh Baked Cookies, a bottle of Mountain Valley spring water and a pop-up map of Los Angeles to aid your guests in their tour of the city. 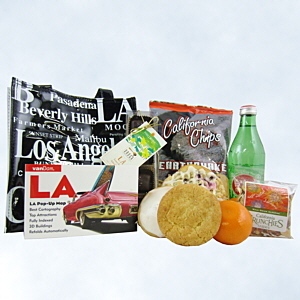 Everything is packed inside a fun reusable tote that your guests can use long after their LA trip is over.